The other day, I grumbled on my Facebook page (where I have become a chronicling fiend for my travels) about how I went to a hotel restaurant called “The American Grill” when I heard they had a “buffet breakfast,” but was flummoxed that there were no pancakes, bacon, waffles, or hash browns –all stuff we consider critical back home. Instead, baked cheese, grilled vegetables, steamed mushrooms, and other oddities I would never see at a breakfast buffet. Someone took issue with how I was travelling and if I didn’t want what was on offer, I should stay home. It really irked me, because if I’m going to travel for five years and there’s some insane expectation that I should like all of it, then I might as well just hang up my writing gig now and not share any of it, because you’re asking the impossible. Undoubtedly, there will be a hell of a lot of road bumps along the way. And sometimes, all we want is a little touch of home to help us think we’re not so far-flung from the life we’ve left behind. In fact, there already have been lots of struggles. 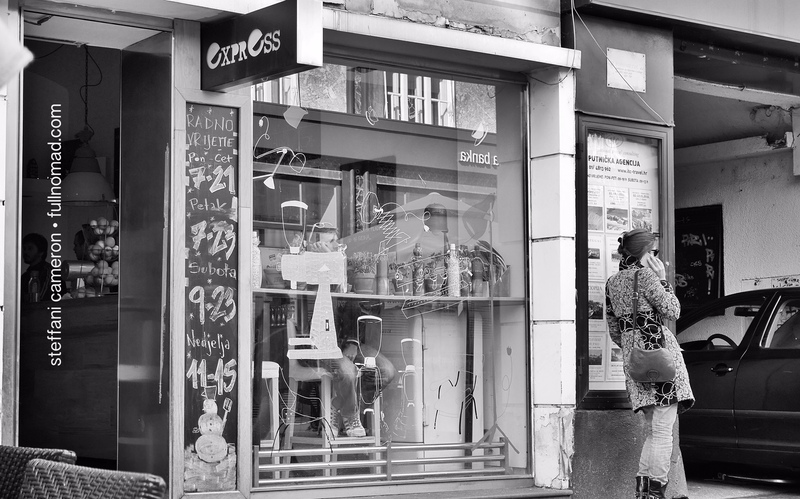 What HAS been going right is some of my photography — I nearly didn’t get this shot and it’s one of my all-time favourite “street photography” candid-camera shots. I’d say it’s worth some inconveniences. 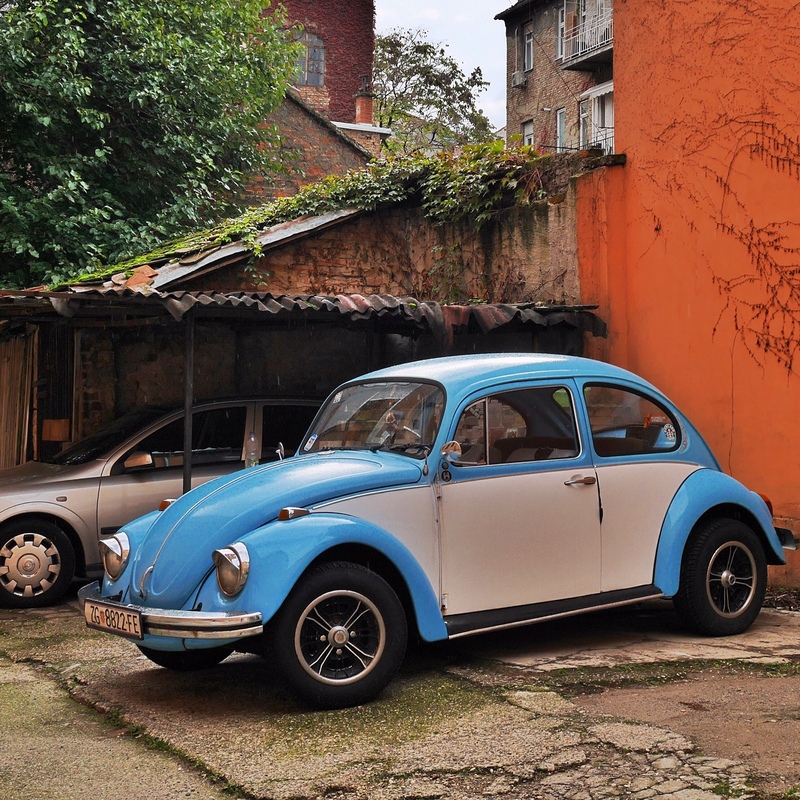 But how can I be bummed when awesome old VW bugs like this are hiding down a little side street in a back alley in Croatia, and I found it? And there have been other fun little things too. So, yes, I wanted a specific breakfast one day and went out to have a weird interpretation of what an American breakfast was (totally not even in the ballpark) and it was the breaking point and I complained. Comfort food, man, it heals a lot, and when you don’t get it when you think you’re gonna, it’s crest-falling. Despite all that, I’d still make this plunge for the travel life. I know there will be awkward adjustment periods. I know it’s worth riding out. Sometimes the great stuff only comes when you stick it out through all the crap. And even after the crappiest rainy days, sometimes you take a nap, step outside, and see a fantastic world like this. 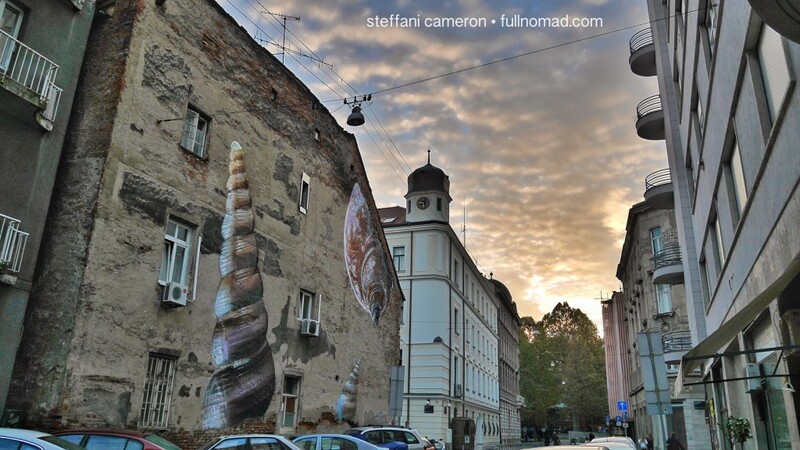 A building with seashells and a stunning sky. Because: Life. Unlike a lot of people who maybe take up this lifestyle choice because they’ve travelled and want more, I’ve never been abroad other than to London at the age of 17 with my mother being the one dealing with logistics, and we stayed with family friends who sorted the weirdnesses out for us. For me, I had to pretty much either accumulate more debt to travel (not cool) or sell off everything and make travel my life, in which case I might actually SAVE money (very cool). Would I like a “home” to return to now and then? You bet. Am I crazy about my life being at the mercy of AirBNB hosts? Not so much. But those were my choices. All travel, or none at all. 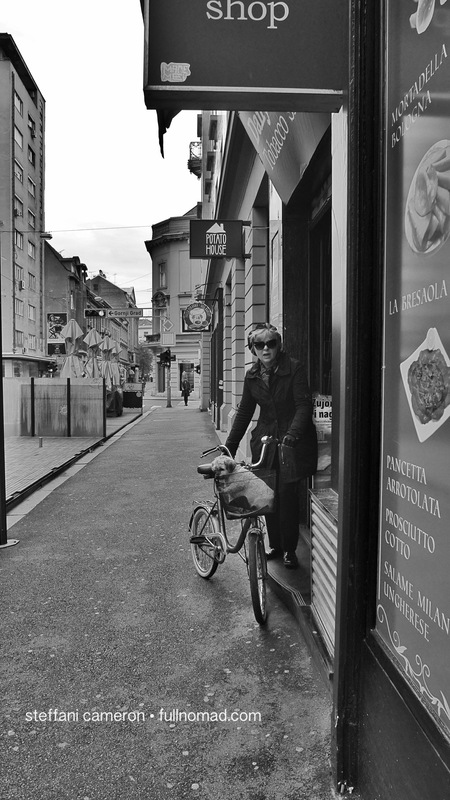 And even sitting at coffee, something looks remarkably lovely about life in Europe. Worth the hiccups? Yup. Here, I’m alone, and it’s a foreign language, and I’ve never, ever done anything like this before. Jetlag is a first for me. Culture shock, also totally new. Currency conversion, all of it — new. That it’s not begun smoothly is not a surprise. If you’re wanting to do a big thing like this, I guarantee you, it’ll come with shocks and challenges for you too. For anyone who’s ever moved house, you know how stressful that can be. Well, I didn’t just “move,” I sold everything I owned, I wrangled paperwork, insurance coverage, two years of research, bookings, and fine print, and it was pedal-to-the-metal for 6 full months before I got here. 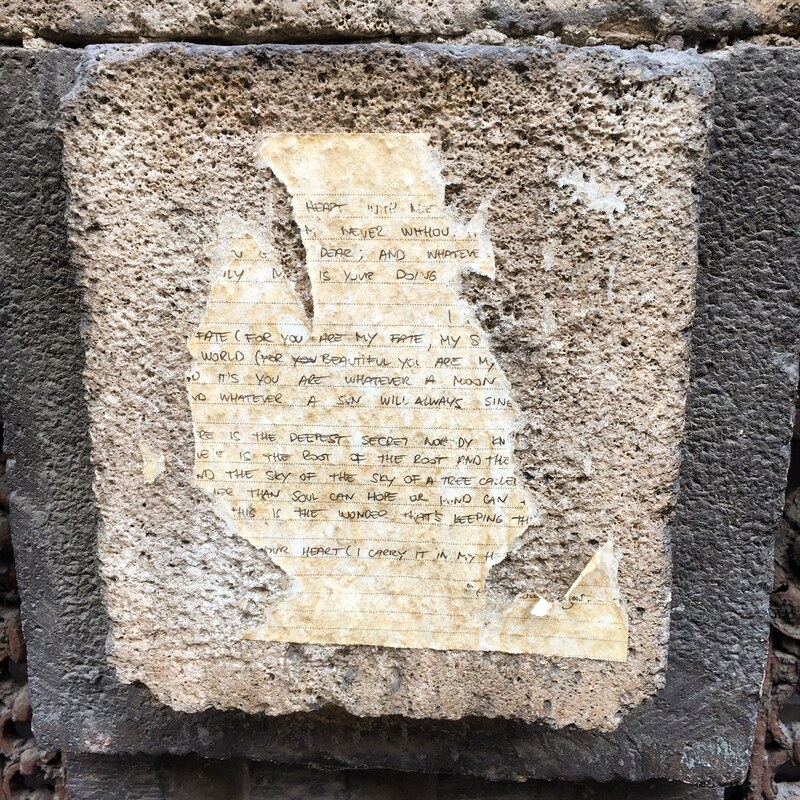 The nice thing about being somewhere new is, everywhere you look — something new, like a love note weathered and torn asunder pasted to a random wall. All that chaos before I left made me so tired I wasn’t aware someone stole my coat off my chair in an airport, or notice that I had left my FitBit in the security bin at the next airport. (A fun $400 loss between the two.) It’s made this lack of sleep due to jetlag a completely different hell I didn’t see coming. I was sure I’d show up so exhausted that I’d just sleep whenever I wanted to sleep, but it turns out that’s completely naive and the body doesn’t work that way. And yet: My life is awesome. I know these things will solve themselves. I know I’ll catch up on sleep next month when I’m living in a little medieval town in an area that is described as being akin to Tuscany from 50 years ago, population about 600, with starry skies, fog-filled autumn valleys, surrounded by vineyards and truffle forests, with a hot springs and full massage spa just a 10-minute drive away — and I’ll be there for 28 days. 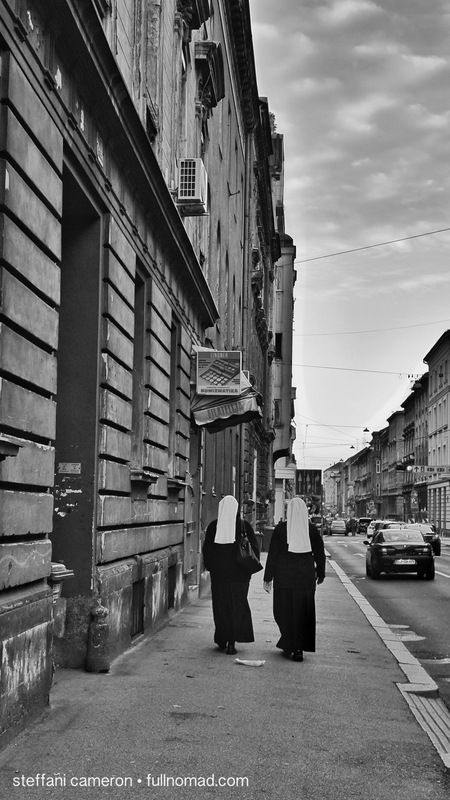 Zagreb’s “Sister Act” — I’ve seen more nuns here in 2 weeks than in Canada in 2 decades. Every day, no matter what frustrations I’ve felt, I’ve also found something awesome to make me smile or feel jazzed about the choices I’ve made. If this were easy to do, everyone would do it. But there are real sacrifices and struggles that come with living your dream. If you think otherwise, then good luck achieving yours. When I share my travels with you, I want to do so honestly. When I tell you about amazing things, you will believe me, because I’ll have told you about the bad days too. There are enough sanitized lives on the internet. It’s flat-out unhealthy for the rest of us to be exposed to people with seemingly “perfect” lives. It’s unhealthy to try to pretend your life IS perfect. No one’s life is perfect. Everyone has bad days. Let’s be real about those and share them. A first nice day, really, since I arrived. Nice to see folks sitting in parks and elsewhere, beyond just awning-covered cafe sidewalks. In the end, if you see that I have these struggling days but, gosh, some freakin’ amazing ones in the mix too, then if you decide to take the plunge and try the nomad life, you’ll be prepared and possibly even emboldened by the knowledge that my times came with a mix of all of these things. And isn’t that what writing is for? Sharing the human condition? Letting us all find commonality amongst ourselves? My pain is like your pain is like their pain? My joy is akin to yours? So today I write for you with the knowledge that Croatia’s onslaught of rain appears to have turned the page. Sunny days are here again. If I’m lucky, tomorrow I’ll learn my long-lost, far too expensive coat has finally reached this city — and hopefully those who have agreed to receive it for me are honest enough to pass it on. And if not? Well, I’ll figure that out too. Somehow it’ll all work out, because I’m resilient and that’s just what I do. After I complain a bit and get it out of my system, that is! 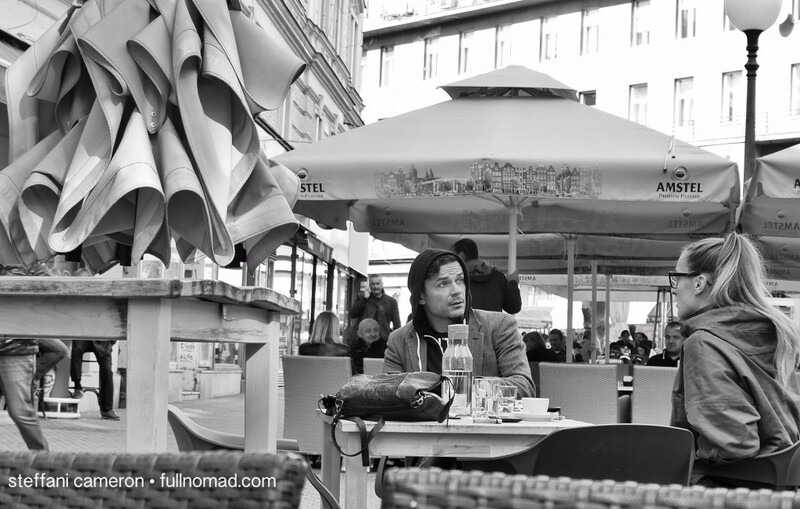 Another shot from today, when I enjoyed some coffee and took the time to relax. Looking forward to continuing to read about your true experiences, no fluff just tell it like it is. Also hoping things do get better for you. Enjoy your journey what ever it brings, it will be like no other! This is so true. Keep keeping it real. Authenticity is it’s own reward. 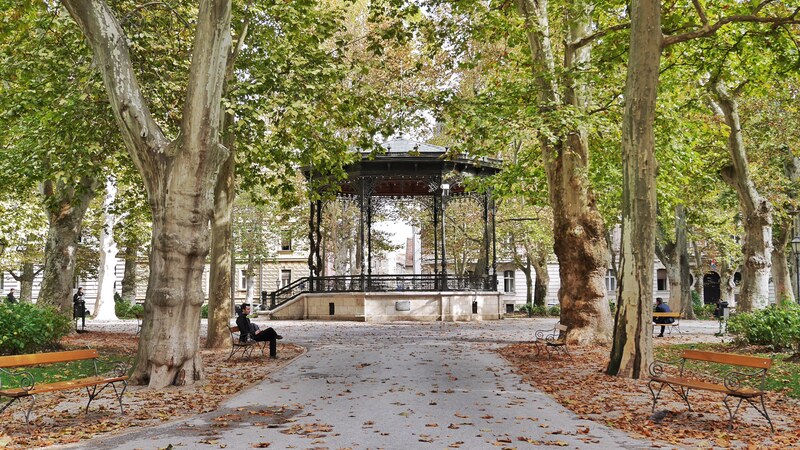 Would you visit Zagreb for longer than 2 days? These folks did.